And another Carlisle view from Ted Talbot. On the back is written: "Bog Junction, looking north, c 1878." This is indeed Bog Junction looking west. Through the left hand arch of Bog Road bridge (really Currock Road) is the M&C curve to Forks Junction and Currock Junction. 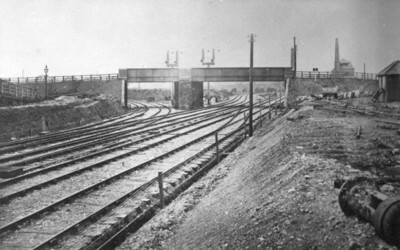 The left had pair of lines going straight on are the Carlisle Joint Goods Lines from Upperby Junction, the right hand pair, the North Eastern Railway's Canal branch, these joining up at Rome Street Junction, � mile ahead, and immediately diverging but on opposite sides. The NER lines had formerly been at the higher level on the right. The photo dates from circa 1878.